For the second consecutive year the North Beach Beavers crew from Christchurch has won the annual Pub to Club event. Whangamata took out the U23 men's division of the race, heading off the Red Beach Pirates crew. 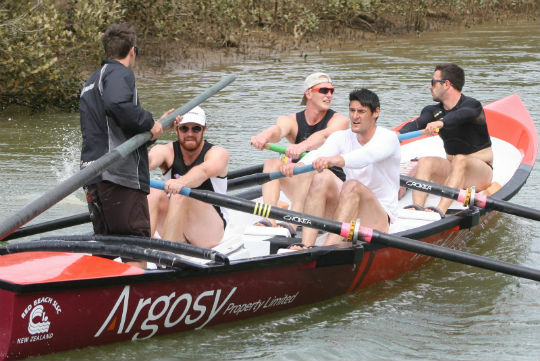 Seven crews began the race at Puhoi and rowed the 16km course down the Puhoi River and across the ocean to Red Beach. 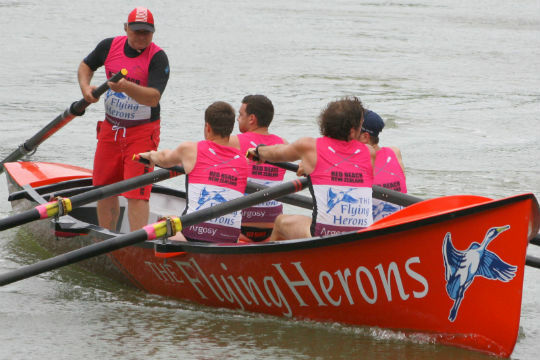 Two Red Beach crews took part in the event which was again sponsored by Bryan & Pat Heron of The Flying Herons. Calm, sunny conditions prevailed for the stretch of ocean from Wenderholm to Red Beach. In last year's race, strong winds forced the organisers to finish the race at the Wenderholm jetty because of wind gusts reaching 40 knots. Rowing the course from Wenderholm to Red Beach was out of the question. Open Men: North Beach Beavers (1:31.20) 1, Red Beach Boomers (1:32.59) 2, Omanu Masters (1:40.50) 3. U23 Men: Whangamata (1:35.47) 1, Red Beach Pirates (1:38.40) 2. Open Women: North Beach Pipettes (1:50.20) 1. U19 Women: Piha (2:30.20) 1. Up to fifteen surf boats are expected to ply the Puhoi River in the annual Pub to Club Surf Boat Challenge on Saturday 31 October. The event, with Bryan & Pat Heron of The Flying Herons as the primary sponsor, will be raced from the Puhoi Pub to Red Beach, a distance of around 16km. The race is open to all surf boat crews, male and female, with cash and spot prizes up for grabs in all age divisions. The course is along the Puhoi River, past Wenderholm to the sea then across the ocean to Red Beach. The row is expected to take from 85-110 minutes to complete. Crews from outside Auckland that have signified their intentions to compete are North Beach from Canterbury with two crews, the Omanu Masters and a Whangamata U23 crew. Registrations and the briefing take place at the Puhoi River car park at 9.30 am and the first boat will get away at 10.30 am with 2-minute intervals between boats. The entry fee is $50.00 per crew which includes the after-race BBQ at the Red Beach clubrooms. A North Beach open men’s surf boat crew claimed the fastest time in the recent Pub to Club surf boat challenge. It was the first time that the Christchurch-based club has taken part in the event. 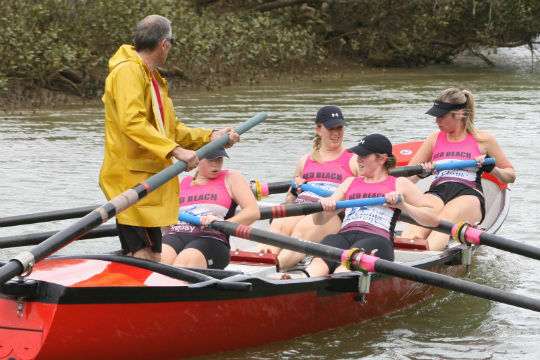 Two crews from North Beach – the other an open women’s crew – flew to Auckland to participate. The women’s crew rowed in a Clymer boat which is permanently stationed in Auckland while the men’s crew borrowed a Red Beach boat. Fifteen crews took part in the event which was sponsored by Bryan & Pat Heron of The Flying Herons. Strong winds forced the organisers to shorten the distance, normally 16km from Puhoi to Red Beach. The ‘cut-in-half’ course finished at the Wenderholm jetty, giving crews just 8km of rowing. On the approach to Wenderholm, wind gusts of 40 knots were encountered. Rowing the open stretch of water from Wenderholm to Red Beach was out of the question. One crew was seen to surf a wave from the finish line to the boat launch ramp. Open Men: North Beach Beavers (36.52) 1, Whangamata (37.17) 2, Red Beach Boomers (37.24) 3, Mairangi Bay Mad Dogs (38.17) 4, Mairangi Bay Muds (38.28) 5, Muriwai Muppets 6. Open Women: Red Beach Sirens (38.45) 1, Muriwai Cats (40.06) 2, North Beach Black Bettys (40.19) 3, Bethells Beach Barracudas (41.15) 4, Whangamata (42.15) 5. U23 Women: Muriwai Muzzies (39.19) 1, Muriwai Muscle (46.31) 2. U19 Men: Red Beach Doom Squad (39.08) 1. U19 Women: Piha Peaches (52.45) 1. The North Beach Beavers boat crew in the open men's division recorded the overall fastest time in the 8km journey from Puhoi to Wenderholm. The Red Beach Sirens crew, swept by Gordon Williams, finished first in the open women's division. For the fifth consecutive year a Piha crew has taken out the Pub to Club surf boat challenge. The event, with The Flying Herons as the primary sponsor, was held on Saturday 9 November. Mark ‘Horse’ Bourneville swept the Piha A crew to a win in a time of 1 hr 25:30. The course was along the Puhoi River, past Wenderholm to the sea then across the ocean to Red Beach. A total of 16 crews - male and female - took part in the annual event with boats being started at 2-minute intervals. The Red Beach Sirens crew of Zita Talaic-Burgess, Madison Smith, Ashleigh Jenkins and Kelly Andrew, with Craig Dillon as sweep, was the first women’s crew to finish the race. Open Men: Piha A (1:25.30) 1, Red Beach Boomers (1:28.55) 2, Piha U23 (1:30.40) 3, Muriwai Mongols (1:31.25) 4, Red Beach Cab Savs (1:32.49) 5, Mairangi Muds (1:35.00) 6, Mairangi Mature Shavers (1:37.14) 7, Orewa Masters (1:50.56). U23 Men: Piha U23 (1:30.40) 1, Waihi Beach U23 (1:33.05) 2, Orewa Seamen (1:47.06) 3. Open Women: Red Beach Sirens (1:37.50) 1, Piha Black Pearls (1:50.52) 2, Bethells Baracudas (1:51.24) 3, Muriwai Chicas (1:51.47) 4. U23 Women: Muriwai Muzzies (1:45.37)) 1, Piha Coladas (1:50.48). Open Men: Piha A (1:31.46) 1, Piha Boomers (1:36.06) 2, Mairangi Men (1:41.06) 3. U23 Men: Piha Pistols (1:34.44) 1, Piha Pirates (1:35.58) 2, Waihi Beach (1:42.39) 3, Sunset Beach (1:47.42) 4. Open Women: Mairangi Magic (1:46.43) 1, Red Beach Sirens (1:59.08) 2, Bethells Barracudas (2:10.43) 3. U21 Women: Muriwai Muzzies (2.04.41) 1. Open Men: Piha A (1:23.22) 1, Red Beach Cab Savs (1:26.02) 2, Muriwai (1:27.10) 3, Piha Boomers (1:27.42) 4, Orewa (1:31.19) 5. U23 Men: Piha Pirates (1:27.36) 1, Piha Pistols (1:30.35) 2. U19 Men: Waihi (1:38.39) 1, Piha Chargers (1:41.39) 2. Open Women: Mairangi Magic (1:30.09) 1, Red Beach Sirens (1:36.11) 2, Piha Pussycats (1:40.23) 3, Red Beach Rowbots (1:50.13) 4. U21 Women: Piha Coladas (1:38.52) 1, Muriwai Ladies (1.51.00) 2.